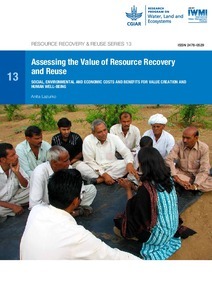 To understand the full value of Resource Recovery and Reuse (RRR), a systematic assessment approach that balances complexity with practicality is required. This report highlights the methods available for quantifying and valuing social, environmental and economic costs and benefits of RRR, focusing on Cost-Benefit Analysis (CBA) as the primary framework. Rather than prescribing a standardized technique for conducting CBA for RRR, this report presents broad frameworks and several examples that can be catered to individual contexts. This results in a suggested eight-step process accompanied with suggested assessment techniques which have to be tailored to the type of question the assessment is meant to answer and related system boundaries.